The complaint about any digital music source, compared to a good analogue front end, has always been that the sense of palpable presence isn’t quite there in the same way. It’s expressed in all sort of forms: dry, a tendency to hardness, not the same sense of space around instruments, and so on. This is not the place to enter that argument in detail, but I noted it in writing about the development of my internet music server system (see Part I of this report). I wondered there whether changing my DAC might help, so, in the Wall of Sound spirit of enquiry, I put my money where my mouth is, and went and did just that. I had read Tim Smith’s rave review of the Musical Paradise MP-D1 here on Wall of Sound, had heard good things about it locally, and my editor here assured me it should be an improvement on the Cambridge Audio DAC Magic Plus I currently use*. Garry Huang, who designed it and sells it, lives here in Edmonton, so I contacted him, went and auditioned it (bringing along my DAC Magic Plus), and bought one complete with the upgraded RCA old-stock 5670 tubes. The two DACs are very compatible. 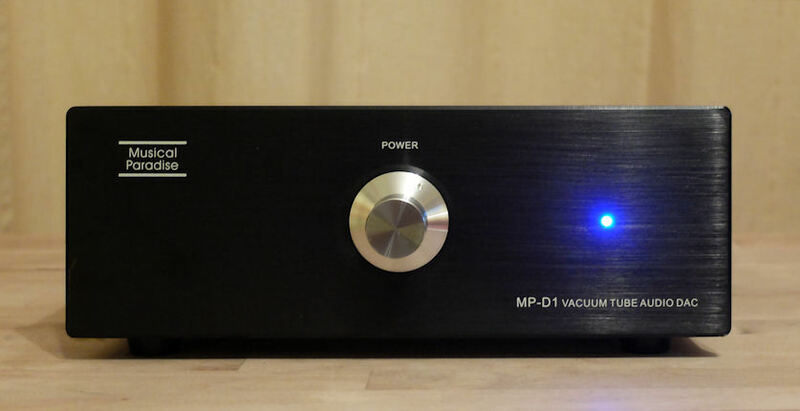 The MP-D1 costs $500 with those upgraded tubes (essential, as they are such an improvement over the stock Chinese tubes); the DAC Magic Plus lists at around $800, but can currently be bought new through amazon.ca for $529. Both have USB ports for digital connections to a PC or MAC music server/internet streaming, and coaxial and optical connections for the digital output of a CD, DVD, or indeed LaserDisc player. They are not far apart in size – the Musical Paradise is about the size of a big hardback book with the top ⅓ cut off, the DAC Magic Plus a small hardcover, though it comes with a neat little stand if you want to place it upright. Both will support 24bit/192khz internet streams. Both require a driver download from their web sites to connect to a computer (and both do so in virtually identical electronic fashion). There the resemblance ends, with completely different philosophies. The Musical Paradise is built around two tubes, with the aim of getting an ‘analogue’ sound. Cambridge delight in a 21st-Century digital technical approach, with the result that much of their manual is gobble-gook unless one has a degree in advanced electronics (it has, for example, three different filter settings to change the shape of the sound, though the manual doesn’t tell you what they actually do aurally). So, philosophically, they are at the opposite ends of the pole. They are also at the opposite ends of the poles when it comes to user-friendliness. The DAC Magic Plus comes with a volume control (which you can bypass/switch out, as I did for almost all my listening), so you can use it straight into a power amplifier. It has RCA and balanced XLR analogue outputs. It has three inputs, operated by small push-buttons on the front – usb for the computer, and two for digital sources, each with coaxial and optical inputs. These each have their own small LEDs, so you can instantly see which source you are currently using. It has another button to change the filter slope. It has a row of small leds, in the usual steps from 44.1khz (CDs) to 192khz, to show what rate the current source is putting out. It has a phase button to change the phase (very occasionally this does make a difference). It has a ground switch for the usb, just in case (as apparently can happen) there is a ground hum when connecting to a PC. It has a digital output (both coaxial and optical) to through-put a digital stream (to, for example, a multi-channel processor), and a second usb port for an external device (such as Cambridge Audio’s own Bluetooth device for streaming from an iPod or equivalent). Its power is outboard (with a small transformer). It is very well thought out, and thus both versatile and extremely easy to use. A CD player, a DVD player, and the computer can easily be hooked up and left hooked up (it’ll automatically identify coaxial or optical), and simply switched by the little buttons on the front. The khz lights are reassuring (and have once or twice indicated an error in my PC streaming, when the rate was clearly too low). The Musical Paradise again has a completely opposite philosophy. There is simply one big power knob on the front, and one ‘on’ indicator light (very bright blue). Everything else is on the back. 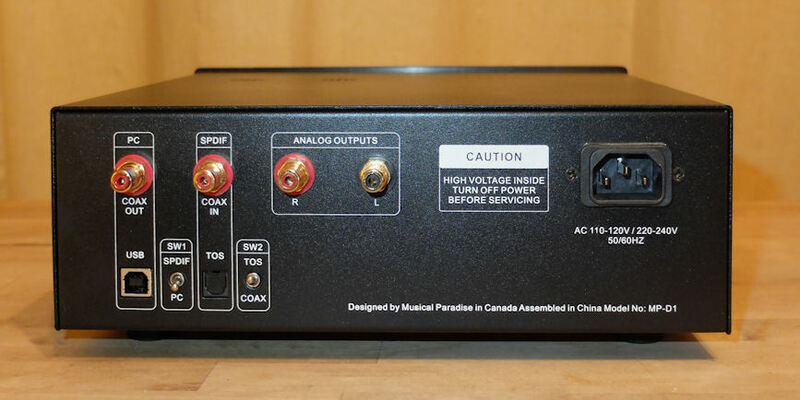 There is, like the DAC Magic Plus, a digital output (coaxial only). There is a mains power lead connector (I used a high-quality mains lead for my listening, replacing the standard cable supplied). There are a pair of RCA analogue outputs (no balanced). There is the usb input for connection to the computer, and a digital input and an optical input. These are selected by little toggle switches (one for switching between usb and digital input, one for switching between the coaxial and optical digital input). One can link up a computer and two other digital sources – say a CD player and a DVD player – but one has to be on the coaxial and one on the optical inputs, and then you have to use one toggle switch to change between them, and the other toggle switch to change between computer and disc source. And here is the first real annoyance with the Musical Paradise. I can see that some might use it simply to connect to a computer only, or simply to a CD player or transport on its own, but for most of us it will be used to a) stream from a server/the internet and b) as the DAC for a CD player or transport. To change between the two, one has to reach around the back, get one’s fingers between two cables, and toggle the little switch, sight unseen. This is really awkward, and means you have to leave enough room around it in a stack to be able to squeeze your hand around the back. More than once I have wondered why nothing was coming out playing a CD until I realized I had left the toggle switch in the usb position. More than once I have got the wrong toggle switch. A second annoyance was that on-off switch. Woe betide if your switch the DAC off before switching the rest of your equipment off. It is not suppressed, and you’ll get a series of weird and grating sounds through your speakers. User-friendly this DAC is not. But the point is the sound. 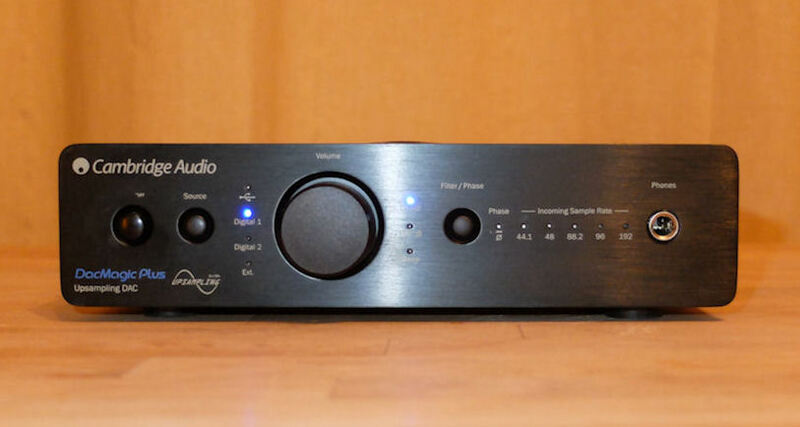 Let me immediately say this is not a comprehensive review of either item – Tim Smith has comprehensively reviewed the Musical Paradise here on Wall of Sound, and the DAC Magic Plus has been reviewed just about everywhere. My task here was to use both in a dual purpose: playing my CDs through them, and streaming from the Internet through the server system I have described in Part I. In other words, real world usage – and I had bought both of them. No review samples here! However, it turned out to be one of the most fascinating audio comparisons I have ever done. The DAC Magic Plus is well broken-in. The Musical Paradise had done about 20 hours, and I ran it constantly for a further 24 hours before doing serious listening tests. I set them up so that on CD I could do A-B switching (using both the coaxial and optical outputs from the CD player, one to each DAC – in the interests of fairness, I switched these regularly, but could notice no discernable difference between the two cabling systems). I tried all sorts of sources, from ECM jazz to Joni Mitchell to Pink Floyd to Wagner opera to early music to large-scale orchestral, and on the Internet from jazz to BBC Radio 3 live concerts. Here is a summary of what I found. The Musical Paradise sounds wonderful on solo vocal music, from the solo voice on Paul Hillier’s Proensa (ECM 837 380-2) to Joni Mitchell singing virtually unaccompanied – anything where there was a main solo voice with not a lot around it, and I recalled that that was exactly the kind of music that Gerry Huang himself demonstrated it with when playing his own CDs. There was a sense of presence, of ‘space’ around the solo voice – just the kind of ‘analogue’ sound Garry was aiming at. The same could be said of a guitar solo in the middle range. A head start to the MP. But as soon as the material became more complex, it was a different story. The DAC Magic Plus resolves detail in a way the Musical Paradise simply can’t do. With the latter, the complex choral voices in the first Act of Philip Glass’ opera Akhnaten (Sony Masterworks M2K 42457) sounded muddled. So I listened to the LP, and the CD through both DACs. The LP has the clearest sound and the best sense of presence. With the CD, the DAC Magic Plus was the closest to that sound, the Musical Paradise last – the extra ounce of detail simply wasn’t there. To give another example, ‘Will’ on the Rypdal/Vitous/DeJohnette jazz come-New Age CD (ECM 1125) has a fairly continuous cymbal beat on the left channel. With the DAC Magic Plus you can hear the subtleties of the stick on the cymbal. With the Musical Paradise, when the rest of the sound got more complex, it seemed to recede, sounding rather like a click-track. That actually summed it up pretty well. It’s subtle, but there is a bloom, especially in the middle range, that muddies things – a lot of listening later, and it made me think of listening to an orchestra playing in a church as opposed to a concert hall, with the extra reverberation – as if there was a tiny amount of echo added to the material. And I suspect that is what happening – the Musical Paradise is adding a little distortion into those critical mid-frequencies, an overhang to each note (it would be interesting to do a sine wave comparison of the two DACs). The result is that on solo voice or material with only a few instruments it sounds super, as that little bloom gives a (albeit false) sense of presence. This is something, of course, that an awful lot of people like, and I can well understand the rave reviews it has got, because of the very nature of its sound. It is also something – albeit a lot more subtly – that my beloved Radford amplifier (an amplifier a lot of people swear by) adds, and my Sonic Frontiers doesn’t. And nor does my LP front end. But by the same token, this muddles detail, especially in more complex material, and it was noticeable that the DAC Magic Plus has more accurate pin-pointing of instruments in the acoustic space – something dependant on clarity and detail. My conclusion, entirely based on my listening, was that the DAC Magic Plus is probably being more faithful to the original material. Sound stages, by the way, were pretty similar, but with the same effects: on solo voice lightly accompanied, slightly more effective with the MP-D1, on anything more complex, better (especially back to front) on the DAC Magic Plus – and that, I am sure, is partly the result of the extra clarity and detail. Only I had been wrong in my assumption. He hadn’t demonstrated the modified MP-D1. He had switched back to the DAC Magic Plus. Now don’t get me wrong. If I can’t share Tim Smith’s unequivocal enthusiasm, the Musical Paradise is a really excellent DAC, and it will give a lot of pleasure to a lot of people, particularly if you want the kind of warm sound it produces. At its price, it is a bargain. But when it comes to which DAC is going to stay in my main system (a purely audio system), the Cambridge Audio DAC Magic Plus wins. First it has that extra clarity and detail that gets me closer to what I hear in an orchestral concert hall. Second, it is so much easier to use to use as a streaming/Internet DAC if you are also using it for CDs – the Musical Paradise is simply too darned awkward. And the Musical Paradise? That has gone into my basement system, set up for both audio listening (and testing) and watching opera – which I do a lot, as I regularly write about opera. In this system the MP has come into its own: running my Pioneer Elite LaserDisc and Cambridge Audio DVD players through it adds that touch of warmth and immediacy that suits the medium (though having to reach behind to toggle between the two is still annoying). Here perhaps a psychological factor comes into play: not having the last ounce of detail (equally noticeable in this system when doing an A/B comparison with the DAC Magic Plus) matters less when you are watching an opera on a TV screen than it does when one is simply listening and recreating the stage in your imagination. There is always a temptation for us audiophiles to gravitate towards the exotic and be a little snooty about something that seems to have more of a mass-market element – as, in its way, the Cambridge Audio DAC Magic Plus does. But this fascinating comparison has given me renewed respect for the DAC Magic Plus’ unexotic matter-of-factness, its ease of use, its audio clarity. Until I find (and can afford) the DAC that has similar accuracy of detail and a tad more warmth, it will continue to define my digital listening, whether that be my CD collection or the Proms streamed live from the Royal Albert Hall on BBC Radio 3. *Editor’s response: My apologies for the false assumption on this. My brief experience was with the older DAC Magic (not the Plus), and not with USB. I wasn’t overly impressed with the standard Cambridge. My system at the time was also not as resolving as today. Editor’s Note: The Cambridge Audio DacMagic Plus This recording is recommended, and Wall of Sound encourages its’ readers to buy from a local, independant record store whenever possible. 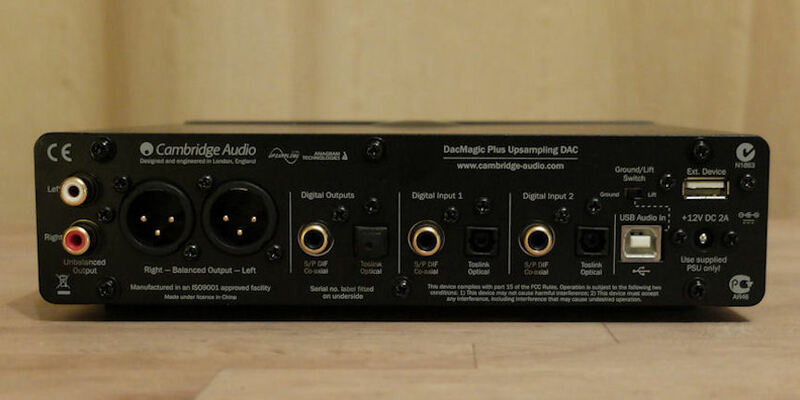 If you have no local option, please consider supporting our website by ordering from Amazon using our Affiliate link: Cambridge Audio DacMagic Plus. Thank you! In my article, I suggested that it would be interesting to see a sine wave put through both DACs. His measurements seem to confirm what I suspected: that the DAC Magic Plus essentially reproduces accurately what you put into it. That, of course, does not necessarily translate to audio bliss (why so many people, including me, so enjoy tube equipment is for the added warmth), but it may explain the accuracy of its detail that I like so much (especially when using the usb input). His measurements page also reminded me that I failed to mention that the DAC Magic Plus (unlike the Musical Paradise) also has a headphone socket, which, with the volume control, means you can use it as a headphone amp. Since I never use headphones (except once in a blue moon on my smartphone) I didn’t use this socket in my listening. Incidentally, Ken Rockwell also has an excellent page on the reasons for having two subwoofers in a stereo system, not one – something I entirely agree with, and which I use in the second system I mentioned in the article.